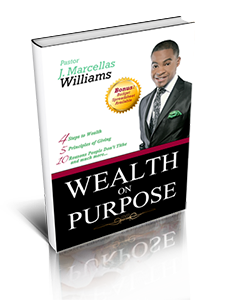 In this book you will learn from a practical approach the 5 Principles of Giving, 4 Steps to Wealth, 10 Reasons People Don’t Tithe and much more. This is not a money lesson. It is a wealth lesson that includes money. In this book you will find scriptures directly from the Word of God that teaches us in the area of our finances. In order, to accomplish wealth on purpose, it will take discipline, consistence and persistence. It will take reading, reading and reading it again. More importantly, it requires applying the principles. This book will challenge you, confront you but above all it carries an anointing to change you. Of course, when you change your financial life will change. Trust God and yourself and start your journey to Wealth On Purpose today.